Designed from the ground up to be the ultimate headlight for on the job use. Industrial and construction site applications are some of the most demanding environments for portable lighting devices, and many are not up to the task. 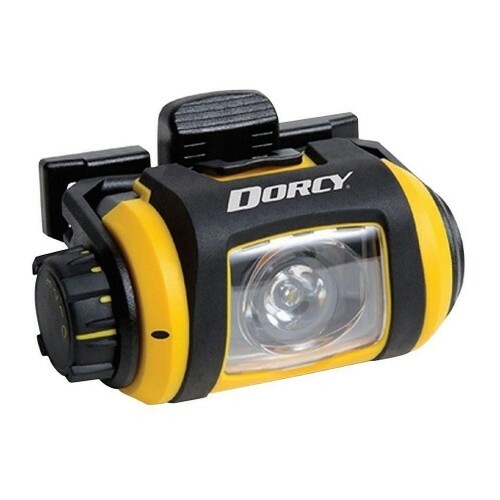 The Dorcy Pro Series headlight is anything but delicate and fragile. Starting from the bottom up, the Pro Series Headlight System was designed using the latest engineering techniques, the best possible materials, and the latest technology. The result is the most technologically advanced, rugged, and durable headlight ever made. We guarantee you have never seen a headlight that is more advanced, better constructed, and well suited for heavy duty work! Despite its durable and tough body construction, the 41-2612 is portable, lightweight, and extremely comfortable to wear. The automatic built in battery power indicator feature keeps you informed so you'll never have to guess how much power you have left. The PRO Headlight has a beam distance of 100 meters, a 180 degree swivel, and three levels of brightness. It survives a drop test of 2 meters and has an IPX4 water resistant rating. Built in Safety Lock/Off feature prevents turning on while storing. A quick release clip makes taking the light on and off the strap easy. Strong magnets on the back of the light can be used to attach the headlight to magnetic surfaces. Includes a Lifetime Warranty on any manufacturing defect.